Frustrated with the hardness of borewell water, H Ramesh and his family are harvesting rain in their Mysore house for almost all their domestic uses. Shree Padre has more. Mysore city may not have many parallels to H Ramesh and his familys achievement. 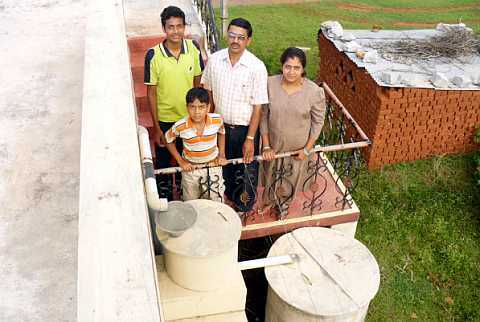 Since the last five years, this five-member family has been drinking only rainwater. Each of them is so passionate about the gift from the sky that they are like fish out of water if compelled to use corporation water that is very hard in the areas around Bogadi in this city. Scales accumulated in corporation water tank. Pic: Shree Padre. Both husband and wife have spent considerable time and effort in planning out their decentralised rain storage system that supplies water to the consumption points by gravity. A 1,000-litres tank with readymade cement rings is located just outside the kitchen. Another 5,000-litres tank is by the side of the bathroom. Overflow from this tank fills an underground sump with a 6,000-litres capacity, situated below the portico. Any overflow from this sump plus the run-off from the rest of the house site with a floor area of 60 x 40 feet is not allowed to escape. A concealed 4 X 3 X 3 cubic feet rain pit just outside the gate percolates this water too. With this arrangement, this house has zero run-off. The terrace measures 100 square metres. We have about 800 mm of average rainfall. Out of the total rain of about 80,000 litres that falls on our terrace, we store and use around 60,000 litres, assesses Ramesh. It fulfils the drinking and cooking needs for the entire year. In the kitchen and bathroom, there are separate taps for rainwater. Drinking water is just filtered out in a candle filter. Stored rainwater also suffices for bathing for eight months and only for head bath for the rest of the year. Rest of the requirements like flushing the toilet, washing clothes and utensils, etc. are met by the corporation water. Except for the sump, the whole rain harvesting arrangement has cost the family Rs 12,000, that is, two rupees for every litre stored  in the year 2003. A couple of years ago, due to an unusually long gap between rains, the family didnt get rainwater for drinking for two months. We really felt so uncomfortable for those two months, recalls Ramesh. This crisis prompted the family to dismantle the present drinking water tank and to reconstruct one with 1,500-litres capacity. Using a cement ring with a slightly larger diametre is possible in the space. The same filter that is placed on the chajja, above the window, now can be used for the bigger tank too. "The toilet soap that lasts for 25 days with rain water gets exhausted in 15 days in corporation water. For washing copper vessels, for swabbing the floor and bathroom tiles, the results from rainwater are glaringly different. Dal gets cooked better in rainwater." Ramesh' family near their drinking (rain) water tank. Pic : Shree Padre. The corporation borewell is not far away from this house  within 150 metres. Recently, to prevent water logging in the front portion of this row of houses, a bund was constructed. Ramesh notes, After that, in the monsoon, our corporation supply is a little less hard. But come summer, the hardness increases. However, a plea to arrange for artificial recharge of this borewell has fallen on deaf ears. But people like Dr Mrutyunjaya on the other hand were very impressed. He has arranged to store 14,000 litres of water. Since the last two seasons this family too is happily using rainwater. Though all the family members explained about the seriousness of the hardness of the public water supply here, photos showed by Ramesh really amazed me. Pointing out to a photo of a bucket full of scales he said, This is the deposition in my 500- litres tank in three and half years. I took out four such bucketful of scales. That means about 40 lutes of scales in 42 months! In the neighboring Roopnagar area, reportedly the water is still harder.